Yesterday I watched my child race into a massive headwind at the tail end of a 300 Hurdle race. She and the other racers appeared momentarily frozen in mid-air as they battled over the last three hurdles to the finish. After cheering her to a second place finish, a friend tapped me on the shoulder. “I really enjoy how much you revel in your children,” she said. Because of the wind I didn’t hear her properly. I heard the word “children,” and I thought I heard “rebel.” I braced myself to learn what sort rebellious thing they had done. She quickly repeated her statement and explained that her comment reflected not only my attendance at sporting events, but also the many Facebook posts and blogs about the girls. Well, Linda, here’s another one. Willow was late coming home from soccer practice last night. We expected her for dinner, however, she walked in the door with a big box from Pizza Hut in her hand. I wondered, was that the day’s rebellious act? In her other hand she held a dozen roses. “Guess who has a prom date? she uttered with a bright smile. Prom is ten days away. She’s been speaking of it for weeks and helping to plan it in Student Council for months. Two days ago she brought home a pair of teal stilts, er I mean pumps with six-inch heels, and she borrowed a slip of a dress from one of her teammates. Apparently she had everything in order except for her date. That was FAR more complicated. Well, obviously the “right” guy finally asked her last night. And what I want to know is exactly when did prom invitations become such production numbers? I’ve seen cars decorated, cakes baked and elaborate ransom notes delivered. Willow’s invitation was not without fanfare, and I’ve gotta hand it to the guy, he clearly tailored it to fit the girl he asked. From what I was told, he showed up at the end of soccer practice with the pizza and the roses. And he also decorated a soccer ball, using colored markers in all the white spaces. Prom? Prom? Prom? Prom? 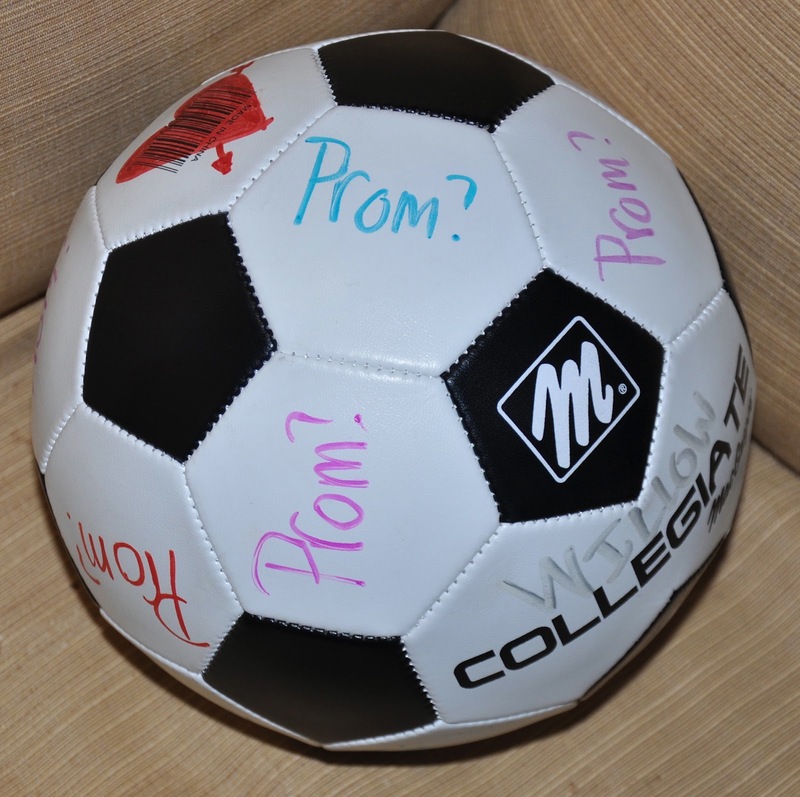 The ball is really cute, and it will certainly keep a bit longer than a cake. End note: This morning the icing on the prom cake is that the AYSA posted the State Cup Tournament schedule. We knew the girls had games on both the day of prom and the day after. We, of course, were hoping for an early game on Saturday and a late game on Sunday. As team manager, I requested prom consideration a few times and I thought the AYSA didn’t listen. “We get this issue every year and we can’t make any guarantees,” said the bored and irreverent administrators each time I phoned. Like a decent boyfriend, however, the AYSA came through for us. 10:00 a.m. Saturday—plenty of time to get ready, ladies. And 1:45 p.m. on Sunday—plenty of time to recover. Both games are in Tucson (as opposed to Phoenix or Casa Grande).